KC-602 Super-Strip masking film products are ENGINEERED SPECIFICALLY FOR BOTH ELECTRONIC CUTTING EQUIPMENT AND HAND CUT GRAPHIC ARTS APPLICATIONS. The unique emulsion allows stripping of the unwanted matrix at a speed unmatched by current competitive products. The coating is attached to an optically clear polyester base using a special adhesive layer. Its SELF HEALING FORMULA allows cutting mistakes to be corrected by firmly rubbing the emulsion flat into the clear polyester base and re-cutting as required. 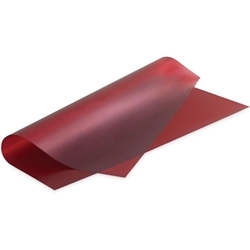 This ruby colored polyester based film is ideal for cutting masks or copy for any photographic masking purpose. This film is over 3.0 opacity to blue light. Reflection density is excellent for use as camera copy.